ActivLife Q10™ Ubiquinol 100 mg / 30 softgels - Nature's Way®. Some people have a tough time converting CoQ10 to its active, reduced form. By supplementing with reduced CoQ10, you can more easily support cellular energy and overall health. * CoQ10 is converted by the body to its active form, QH - an essential step in the production of cellular energy. However, the conversion rate of CoQ10 to QH tends to decline with age. 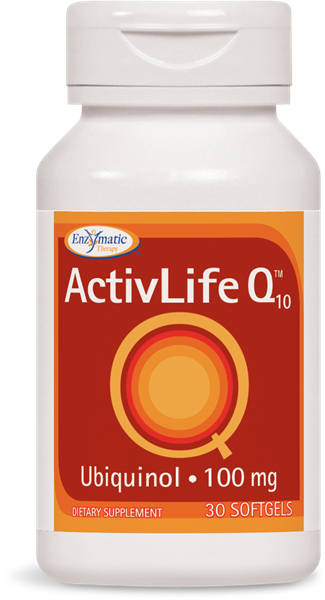 ActivLife Q10 - a stabilized form of reduced CoQ10. ActivLife Q10 uses patented processing that prevents oxidation and ensures a stable supplement. Take 1 softgel daily. If additional support is desired, take up to 3 softgels daily. If pregnant, nursing, or taking any medications, consult a healthcare professional before use. What is the source of ubiquinol in ActivLife Q10? The ubiquinol is derived from yeast fermentation. The material undergoes extensive purification processing, including extraction and filtration steps that remove all yeast proteins generally associated with yeast allergies.